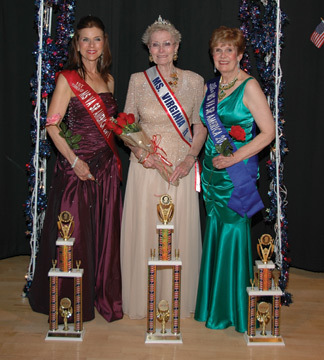 Louise Wade of Dublin is the new 2011 Ms. Virginia Senior America. Wade was crowned Thursday, May 19 at the Kauffman Auditorium, Lee Center in Alexandria. Wade was also the recipient of the 2011 Community Service Award for her continued work in drawing attention to the needs of people with intellectual disabilities. The award is given each year by the pageant organization. According to the Ms. Senior America Pageant, the pageant is a search for the gracious lady who best exemplifies the dignity, maturity and inner beauty of all seniors. The pageant gives women 60 years of age and older an opportunity to display their “inner beauty” talents and elegance. The pageant seeks to draw attention to the achievements of senior women. The Ms. Senior America philosophy is based upon the belief that seniors are the foundation of America, and our most valuable treasure. It is upon their knowledge, experience and resources that the younger generation has the opportunity to build a better society. That is exactly what Louise Wade intends to do—use her knowledge, experience and resources to build a better society. “My platform as Ms. Virginia Senior America is a continuation of the ministry I began quite some time ago: calling attention to the needs of our citizens with intellectual disabilities and contributing to programs to help them enjoy the best quality of life possible. One life can make a difference, and I intend to spend mine doing everything I can to assist our special needs population and their families,” Wade said. Wade is particularly interested in providing programs and other needs for 40-, 50- and 60-year old intellectually disabled citizens. “I have been blessed with lots of energy and the ability to ‘keep on keeping on,’ and I would like to continue helping these adults—many of whom parents are deceased or unable to continue beating the bushes so to speak on their behalf,” she said. “Louise Wade is full of energy and enthusiasm. It‘s infectious,” said assistant State Director Wendy Pinhey of Wade.“Her commitment to physically and mentally challenged people has no boundaries and she was overcome adversity—having been afflicted by polio and has become a relentless advocate for those who are physically and mentally challenged. She draws strength from Melody, her daughter, who is both mentally and physically challenged. Her energy is boundless and her platform strong. Her motto is ‘Let go and Let God,’” said Pinhey. “After surviving polio I knew that the Lord had a reason for my life. I have been strengthened by the challenges that have come my way, Wade said. I feel that worrying is negative thinking, so I’d rather focus on solutions. In all situations do all humanly possible, then let go and let God. He works in mysterious ways for the good of those who serve him,” said Wade. Wade is an author and educator. Her book,“Melody’s Gifts,” was published in October of 2009 and is a touching true story based on the life of Melody Wade, Louise and Jack’s daughter. It is their story, a story about a determined, dedicated family’s search and journey to maximize the life of their daughter, although she was born profoundly disabled. Proceeds from the sale of the book will and have been used for programs and other needs of intellectually disabled individuals. Wade started teaching in Roanoke County 1968. She is an educational specialist with a Masters degree in special education. She was state consultant for Keystone Area Agency in special education in Dubuque, Iowa. During that same time she was the head of the Clarke College learning disability program in Dubuque. She and husband Jack were administrators at Camp Winnebago in Caledonia, Minnesota—a camp for intellectual disabilities. For two years she was a fulltime faculty member at James Madison University. Twenty-five percent of Wade’s time there was a spent as a consultant. She was a part-time faculty member at Eastern Mennonite University, Bridgewater College, Mary Baldwin College and the University of Virginia. At one time she taught at five colleges and universities at the same time. According to Wade she gave all of that up at the suggestion of her friend and colleague, Dixon, to be a part of the LEAP program (Learning Enrichment Achievement Program) at New River Community College. The LEAP program is for students with disabilities who attend NRCC. Wade was a learning disability specialist at New River Community College until her retirement. If any organization would like for Louise to come share the ministry “Melody’s Gifts / Gives Back” or would like a copy of her book “Melody’s Gifts,” please contact her directly by calling 540- 674-8306. Wade will be making personal appearances throughout the state over the course of the year. She and husband Jack attend Dublin Baptist Church. Wade will compete in the national pageant October 2nd, 2011–October 7th, 2011 at Harrah’s Resort Hotel and Casino, Atlantic City, N.J. —By Linda Williams, Staff Writer, “The Patriot.” Visit www.pcpatriot.com.